multilateral and bilateral investment treaty arbitration. Anyone whose pursuits or responsibilities require knowledge of arbitration in England – including practitioners, in-house counsel, business persons, academics, and students around the world – will benefit enormously from this thorough study and analysis of contemporary arbitration practice in the jurisdiction. Chapter 1. Development of the Arbitral System in England. Chapter 2. Relevant Aspects of the English Legal System. Chapter 3. Arbitration in Context. Chapter 4. The London Court of International Arbitration. Chapter 5. The Chartered Institute of Arbitrators. Chapter 6. Ad Hoc Arbitrations. Chapter 7 . Commodity Arbitration. Chapter 9. Engineering and Construction Arbitration. Chapter 11 . The English Statutory Framework. Chapter 12. Applicable Substantive Law. Chapter 13 . The Application of EU Law to Arbitration in England. Chapter 14. Multilateral and Bilateral Investment Treaties and the United Kingdom. Chapter 15. Duties of Arbitrators. Chapter 16. Challenges to and Replacement of Arbitrators. Chapter 17 . Rights and Duties of the Parties and Counsel. Chapter 18. International Arbitration in England: A Procedural Overview. Chapter 20 . Support and Supervision by the Courts. Chapter 21. Confidentiality in Arbitrations in England. Chapter 22. Multi-party and Multi-contract Arbitration. Chapter 25 . Challenges to Arbitration Awards. Chapter 26. Enforcement of Awards. Chapter 27 . Arbitration in Scotland. Chapter 28. Arbitration Law in Ireland. 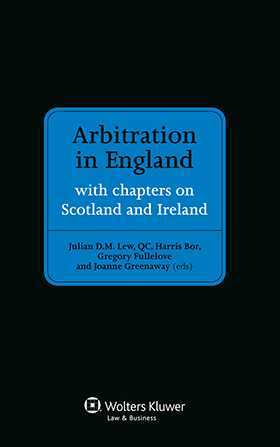 'Arbitration in England is therefore a very useful companion to another of Lew's significant contributions to the literature on arbitration, Comparative International Commercial Arbitration, co-edited with Loukas Mistelis and Stefan Kroll. It will certainly be a primary source of reference for this reviewer as for all those with an interest in arbitration. It is also a model for anyone intending to make other national arbitration laws known to an international public.